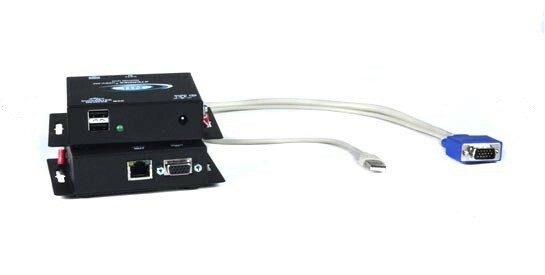 The XTENDEX® USB KVM extender provides local and remote KVM (USB keyboard, USB mouse and VGA monitor) access to a USB computer up to 300 feet (91 meters) via CAT5/5e/6 cable. The extender is available with optional stereo audio. Supports resolutions to 1920x1440. Also known as: CAT5 USB KVM extender, remote keyboard mouse monitor, usb kvm extension 300 feet (91 meters) long, kvm balun. The XTENDEX® ST-C5USBV-300 USB KVM extender extends a USB keyboard/mouse and VGA display up to 300 feet via CAT5/5e/6/6a cable. Each ST-C5USBV-300 consists of a local unit that connects to a computer and provides local keyboard, monitor and mouse connections, and a remote unit that connects to a keyboard, monitor and mouse. The local and remote units are interconnected via CAT5/5e/6/6a cable. Compatible with all video resolutions up to WUXGA (dependant upon CAT5/5e/6/6a extension length). Local access not available on local units supporting two remote users. Works with USB keyboards and mice only – does not support other USB devices. Allows users to back-rack broadcast quality servers without impact to post-production operations. One male 15-pin HD / one male USB Type A connectors. Optional stereo audio support - 3.5 mm stereo plug. ST-2C5USBV-L-300: female 15-pin HD connector for downloading DDC table for remote monitor. One female 15-pin HD connector and two female USB Type A connectors. Supports most USB keyboards and mice, including wireless models. Supports Logitech M100/M-BZ96C/M310 and Dell 0XN967/K251D/XN966/0Y357C mice. Local access not available on local units supporting two remote users, ST-2C5USBV-L-300. The ST-C5USBV-300 will only work with USB keyboards and mice. It is not designed to support other USB devices. Keyboard and mouse must be of the same platform. Use CAT5/5e/6/6a straight through cable for TIA/EIA-568B wiring terminated with standard RJ45 connectors (not included). ST-C5USBV(A)-300: 110 or 220 VAC at 50 or 60 Hz via AC adapter. ST-2C5USBV-L-300: powered from attached computer. The XTENDEX® ST-2C5USBV-L-300 Dual User Local Unit allows two remote users to access a computer located 300 feet (91 meters) away via CAT5/5e/6 cable. Two RJ45 connectors for connecting two remote units. Two users can access the computer on a one at a time basis. Locked out user must wait three seconds after last keystroke or mouse movement occurs on active user. Features push button for downloading DDC data from monitor connected to VGA connector. "Thank you very much. The ST-C5USBVA-300 has taken care of our problem, and that is a big relief for our hospital. We have a Xmark tracking and monitoring product called The Hugs Infant Protection System for the healthcare and security markets. It is a Windows based system that constantly monitors the location of infants via an electronic tag and all exits from the department. This computer system as with any computer system has to have parts, keyboards, etc. replaced from time to time. In our case the computer chassis is in a locked box, hidden away from sight and only the mouse, keyboard, display and audio components are at the nurses station for security. Password protected as well. We had a new USB mouse and keyboard attached to our system via a separate USB extender which caused a lot of intermittent problems, such as computer lock-up, especially after long periods of inactivity. After trying various configurations to no avail, I started researching for new and different manufacturers of a USB KVM + Audio Extender set to simplify and eliminate our problem. NTI's description of their unit had a statement of 'Keep-alive keyboard/mouse emulation for flawless operation' which piqued my curiosity. After talking with a NTI representative about our situation, we decided to try this unit. We have the ST-C5USBVA-300 in and working, and have not had any more intermittent problems. Our security officer is pleased, as is the nursing staff." "I received the ST-C5USBV-300 unit today; already hooked up and working great. We always try to use US manufacturers and I appreciated the Thank You note – nice personal and professional touch!"